The sad fact is that volumes of incoming and outgoing email are growing every year. Email is definitely not dead yet. What this means to you is that managing email is going to require even more of your time every day. How much more can you take? If you too have felt email overload, GOOD NEWS! 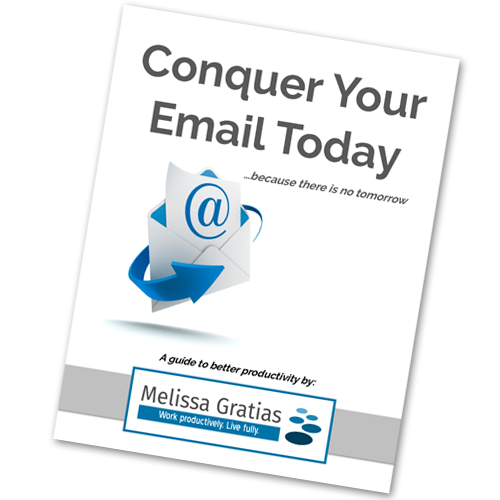 I’d like to introduce you to my eBook Conquer Your Email Today…because there is no tomorrow. 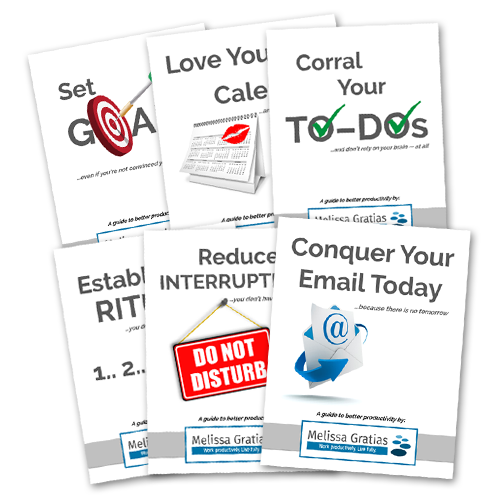 Now you can curb the growth of email when you get my eBook Conquer Your Email Today…because there is no tomorrow for only $3.99. Only $3.99 - Buy Now! P.S. – I’ve put my very best advice in Conquer Your Email Today…because there is no tomorrow. You will finally become part of the solution, rather than contributing to the problem of email overload. Buy it here and get a guide to releasing yourself from a backlog of old email. Like what you see? Grab the whole set at a huge discount! I learned from Melissa that managing my email should not be a job and if I continue to be organized, my email will not take control of me, but I will be in control of my email. Emails have overwhelmed me at times. Now, when I receive an email, I ask myself [Melissa’s] questions and make a choice. My Inbox is nearly empty at any given point during the day. As a result of your teaching, I am proud to share, today, I achieved "inbox zero" (something that I didn't think was possible! ).